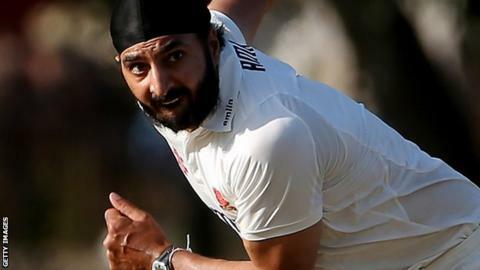 Former England spinner Monty Panesar has been released by Essex. The 33-year-old initially joined Essex on loan in 2013, before making a permanent move from Sussex the following season. But Panesar, capped 50 times at Test level for England, has made just three first-class appearances this season. He is one of four players released by Essex alongside all-rounder Greg Smith, seam bowler Matt Salisbury and wicketkeeper Saf Imtiaz. Panesar took his 700th first-class career wicket against Surrey at Colchester last month, but has not played a Test for England since December 2013 against Australia at Melbourne. He was made unavailable for selection by Essex earlier this season because of off-field "issues". It was the latest in a series of setbacks for the slow left-armer following an omission the previous season for a "timekeeping" error and an incident during his time with Sussex where he urinated on a bouncer outside a nightclub in Brighton. Panesar started his career at Northamptonshire in 2001 before making his Test debut in 2006 against India at Nagpur.